Reports activity on a set of devices. A Selector can be used to monitor a set of Selectables and Timers and wait for activity on them. The wait call can be performed with a timeout and the respective timeout signal is sent if it occurs. Clients can be notified about Timer and Selectable activity by connecting to the appropriate signals of the Timer and Selectable classes. The following example uses a Selector to wait on acitvity on a Timer, which is set to time-out after 1000 msecs. A Selector is the heart of the EventLoop, which calls Selector::wait continously. The EventLoop and Application classes provide the same API as the Selector itself. Adds an IOResult to the selector. IOResult are removed automatically when they get destroyed. Adds a Timer to the selector. Timers are removed automatically when they get destroyed. 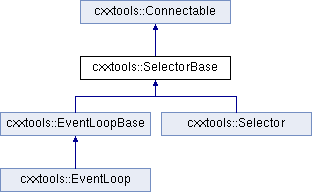 Implemented in cxxtools::Selector, and cxxtools::EventLoop. This method will wait for activity on the registered Selectables and Timers and execute the registered callbacks. It will return when either the timeout has expired or at least one event has occured. When the timeout is 0, then just active events are triggered. When the timeout is negative, it will wait until the next event without timeout. Use Selector::WaitInfinite to wait without timeout. Note that the class Milliseconds has a implicit constructor which accepts a double value, so that you can pass just a number to the method to get a timeout in milliseconds. This method executes just the pending events and returns the time when the next timer is due. When there are no active timers a negative timespan is returned. This method is like wait but the timeout is specified as a timestamp. The method will wait until the specified time. When the timespan is negative, the method will wait until the next event without timeout. When the timespan is smaller or equal the current time, it will just check for active events and execute them. This method can be used to end a Selector::wait call before the timeout expires. It is supposed to be used from another thread and thus is thread-safe.